Everyone has had an idea they think will make a great product. But then some invention questions arise… here are 89 of them. This is the first of a two article set: 189 Brief Questions for Inventors, by Jeffrey Dobkin. Jeffrey is pretty involved in the Inventor community: he has served on the Board of Directors of the American Society of Inventors for over 140 years, and was the president for 4 additional years. Since leaving that group in 2018 he has founded The Philadelphia Inventors Alliance. Oh, sorry. I meant for over 14 years. What state is your invention in? Scribbled on a napkin? A written and sketched idea? Professional drawings, 3-D rendering, handmade proof of concept prototype, manufacturing prototype, samples made, product finished? Doesn’t matter. Here are the next 89 invention questions every inventor should ask himself (or herself). And answer. This is a longer article with answers and commentary to these questions. Please CLICK HERE to read this article. 3. Have you done a patent search? 4. Are you going to patent it, or not? 5. Is your product “Commercially Feasible”: can you make it and sell it at a profit? 6. What industries will your product sell to? 7. Will it sell itself from a shelf in a store? 8. Can you make a few prototypes? 9. Is it in your own field of expertise? 10. What are your next 10 steps? And now a word from our sponsor: Buy Jeffrey Dobkin’s book: How To Market A Product for Under $500. It’s a simply amazing inventor’s, small business and entrepreneur’s marketer’s Bible. If you’re an inventor who’d like to market his or her invention – you’d be crazy not to read this book. Click here for more information. Thanks. 11. How much will it cost at retail? 12. How much will it cost to manufacture? 13. How much will you make (gross profit) per sale? 14 Has it been field tested? 15. Have you researched to find this or similar products on the web? 16. How many other firms make a similar product? 17. Why will yours be better, cheaper, faster? 18. Who are the people most likely to buy one? 19. Which mail order catalogs will carry your item? Please be sure to see our article “How To Get Your Product in Catalogs” on this website. 20. How many mail order catalogs will carry it? 21. What is your selling price to catalogers? 23. What retail stores will sell your product? 24. What is your product name? 25. What are some other names for your invention in case that one is taken? 26. Is your “product name” URL website taken? 27. What is your website name? 28. What products compete with yours? 29. What are the prices of competing products? 30. What problem does your invention solve? 31. How common is this problem? Are you serious about your invention? Or the inventing process? Or marketing? Even if you’re just kicking some ideas around, you should see Jeffrey Dobkin in this one hour video presentation to inventors. Jeffrey spills all in the information rich video about invention marketing, patents, licensing, prototyping and getting your product together and getting it out there to see if it can be sold — in whatever stage it’s in. Even if it’s just an idea scribbled on a napkin, Dobkin shows you exactly how to find out if it will sell, and if it’s a commercially feasible (you can sell it at a profit) invention. Here’s your chance to make fun of Jeff in this home-brew video, but who cares, the information is seriously intense. You aren’t likely to get this much useful, practical information anywhere else. Easily worth 10 times the price of just $29.95. 32. How can you reach people who would want your invention? Magazines? Which ones? Newspapers? TV? 33. What section of a store would your product be placed in. 34. How can you reach people with this problem without wasting money reaching others? 35. How can you reach people who will want to purchase your product without wasting money reaching others who don’t. 36. Are you applying for a patent? 37. Are any patents similar in nature? 39. Are your patent claims broad or narrow? 40. How strong is your (potential) patent? 41. How many patent claims do you have? 42. How easy is it to see the validity of your patent claims? 43. What materials are used in manufacturing your product? 44. Will you need expensive $$$ tooling to manufacture it? 45. Will you need molds for plastic parts? 46. What will the tooling cost? 47. What is the manufacturing cycle time to build one? 48. How many can you build in a day, or week to fulfill a large order? 49. What is the length of your first run in units produced? 51. Does it need assembling of multiple parts? 52. Are all parts made in the United States? 53. Does the user need to assemble it further? 54. Are their ‘off the shelf’ parts you can use to make one? 56. Who will be creating the final design? 57. Is it easily breakable? 58. What is the product life cycle before it breaks? 59. What is the product life cycle before it wears out? 60. Does it ever wear out? 62. Do you offer a guarantee? 63. What is the buying cycle (how long till customers need a new one)? 64. When will they need a replacement? 65. How many will people need or buy? 66. Are you going to manufacture it yourself? 67. Do you have several manufacturers lined up to make it? 68. Are you going to market it yourself? 69. What are your projected sales for the first year? 70. What are your projected sales for the 2nd year? 5th year? 71. Are you going to license it? 72. What firms are the most likely candidates to license this from you? 73. What makes yours better than and other similar ones? 74. Is there a big visual difference between yours and other ones? 75. Is there a totally different way yours works? 76. Is there a ‘highly perceived difference’ between yours and others? 77. What are the demographics of people who will buy it? (Younger, older, urban, rural, northern (cold), southern, rich, poor, specific geographic areas such as costal cities, house owners or renters, boat owners, people in a specific industry…)? 78. Is it a consumer product? 79. Is it needed by people in a selected industry? 80. How many industries can you sell it to? 81. Is it consumer market product, or a business market product. 82. Will any chain stores or big box stores carry it? 83. At best, how many will you sell in the U.S.? 84. Have you sold any yet? 85. Has anyone offered to buy one? 86. How did you come up with your retail price? 87. Market Potential: How many will people need one (or can use one)? 88. If you contact 1,000 people, how many will people buy one? 89. If you contact 1,000 people in your most likely market how many will buy your invention? This is the first part of a series of direct marketing articles written by Dobkin, 209 Brief Questions for Inventors. Why don’t you sign up for our occasional email mailing list. Don’t worry, we won’t sell your name or email address to anyone. You can see our email policy here. You can visit our bookstore HERE! You can purchase our Inventor Video HERE. Alternatively, you don’t have to buy our products, you can just send us the money! Thanks. Jeff Dobkin is a funny speaker and an all around good guy who helps inventors with consulting, product development, product literature, and a great marketing plan. 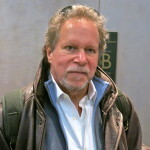 He was on the Board of Directors of the American Society of Inventors for 14 years, and is now the President of The Philadelphia Inventors Alliance. 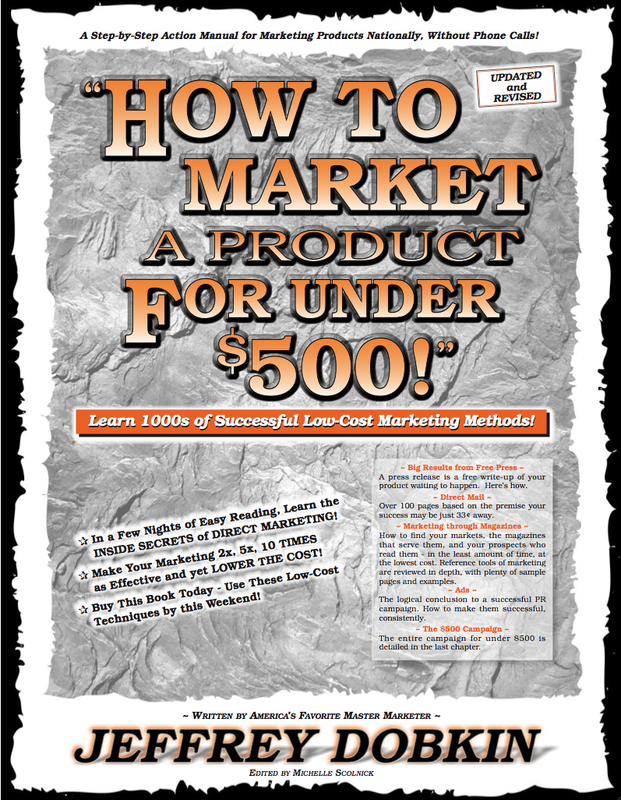 Dobkin has written 5 books on marketing including the amazing inventors, small business and entrepreneur’s marketing Bible: How To Market A Product for Under $500. If you’re an inventor who’d like to market his or her invention – you’d be crazy not to read this book. Call 610-642-1000 to speak with Jeffrey. You can still order a real, “printed ink on paper” version of this or any of his books on Amazon, or online on this site. Thanks for visiting our webpages.